A more uneven treatment of anyone’s work would be hard to find. 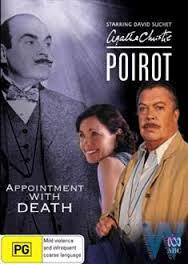 Adaptations of works with Poirot starring David Suchet began in 1989 and continued until last year. Throughout the series, I think Suchet is flawless, the clothes and locations are terrific. The actors are excellent. And the early scripts are, I believe, all good. But then, you get to an episode such as Appointment with Death, where apparently the producers spent too much time smoking a hookah and decided what the novel needed was to be changed almost entirely. Hell, what does Christie know about writing a mystery? A simple overdose? Forget it! We need a far more elaborate set up with a paralyzing drug, a wax ball full of goat’s blood and finally a stabbing which fortunately wound up covering the husband in blood, but not the stabber. All this fooled the doctor into thinking she’d been dead an hour instead of seconds. This is a terrible, terrible adaptation. Which makes me sad because Tim Curry’s in it and John Hannah. Tim Curry’s looking for the head of John the Baptist. Which he apparently finds, though how he knows it’s J the B, isn’t clear. Oh, and Mycroft Holmes plays his son. Neither of these characters was in the book. [Oh, I’m wrong — apparently Mycroft was Lennox in the book. Mrs. Boynton’s son who was married.] This is more dross presumably from the freewheeling imagination of Guy Andrews who wrote the screenplay. There’s also a slave-trading nun. Oh, it’s a grand story. If you like your mysteries gone off the deep end, this one’s for you. I can’t quite understand how the actors managed to do such a good job with such an utter mess of a story. Who made these decisions? I want an apology and a complete re-shoot. 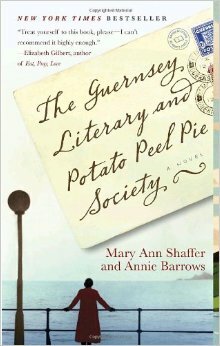 I managed to stay awake until 3:15 when I finished The Guernsey Literary and Potato Peel Society. That was all I read. I will do better next fall, I hope. Which hour was most daunting for you? 20th. Finished a book and the only choice was drink a heck of a lot of caffeine and try to get into a new one or sleep. Sleep won. What do you think worked really well in this year’s Read-a-thon? You all seemed to cope really well with a much larger group, so yay you! If you were a Cheerleader, do you have any advice for next year’s Cheerleaders? I wasn’t. They were great. How likely are you to participate in the Read-a-thon again? What role would you be likely to take next time? Very likely. I like reading. Sorry. Not a cheerer. I had a good time and Guernsey is an excellent book. The heroine is a dope about men, but not in other ways. Minor spoiler: later in the book she can’t figure out why one guy she likes won’t talk to her after meeting her almost-fiance. Duh. She’s not a moron otherwise, thank goodness. The book is full of eccentric characters — mostly from Guernsey, but the main character herself is somewhat eccentric. The book is kind of an odd combination of history of the German Occupation of Guernsey during World War II, romance novel, and I don’t know what you’d call it, but meet-all-these-wacky-but-loveable folks type novel. It did remind me a bit of 84 Charing Cross Road, but it also doesn’t mince words when it comes to describing what the Nazis did during the occupation. Although, it is not pure anti-Nazism. It shows the German soldiers as a mixture of human beings caught up in a monstrous event. Overall, a very good book, I think. I realize this may not be useful to many people as nearly everyone has already read it, but we write these things to get it out of our systems. And to remember a few years from now exactly what we thought of whichever book. As this book is written entirely in letters, it is the first for my Postal Challenge. Okay, I’ve napped. I’ve eaten. Visited a few blogs. Hopefully I will read a little faster now. I’m still on the same book reading at a snail’s pace. Ah well. I’m enjoying it. That’s what counts, right? I’ll just need to pick a shorter book next. It reminds me a bit of 84 Charing Cross Road except with war. I think my new Kindle lies to me about how long it will take me to read the rest of this book. It now says about an hour, but 33% of it is left. I’ve been reading this since 1:30 minus posting and internet time and nap time, which is I don’t know how long, but way more than two hours. So how can I read the last third in an hour? I thought computers were supposed to be good at math. I hope the time is right and not the percentage because I really don’t feel like reading this all night. Plus it seems to be hitting winding up territory. I’m wondering how long I’ll make it through the next third. Feel okay now, but I suspect in 2 or 3 hours it’s going to be tough. End of hour 18 and sadly I can’t think of anything but being in bed. I will try to read there for a bit, but I think we can all guess how this is going to go. This has been an extremely pathetic attempt at a readathon. I’ve only just managed a little over 12 hours given my late start. And that’s not subtracting the nap. Thanks to all the cheerleaders and if I get an unexpected second wind I will post again. Stay awake and read, y’all. Do as I say and not as I do. I’m a horrible example. Argh. Kindle battery low. Score one for print. Maybe it wasn’t fully charged. Thought these batteries were supposed to last for weeks! In the middle of the sixth hour I made it home and started The Guernsey Literary and Potato Peel Pie Society. Unfortunately, it’s an e-book without page numbers so all I know is I’m 5% through it. It’s off to a very good start. I hope to settle in and read much more for the rest of the ‘thon. I should probably move away from the computer. It is now the end of the 8th hour. 4 PM here. And I’m having a tea break after being interrupted by the phone ringing. I was unable to haul myself from the depths of the couch in time to answer it. Oh, well. GLPPP Society is very interesting. Entirely written in correspondence, which you could do in England, here letters take days, you couldn’t invite anyone to the opera for that evening and have a hope of meeting them. It takes place just after WWII and starts off with a young author whose cheerful, stiff-upper-lip columns from wartime have been gathered into a successful book on a book tour. She is contacted by a member of the Society hoping to get a second book of Lamb’s Essays (which makes me want to read Lamb’s Essays) and starts a correspondence first with him and then with further members of the Society. I had no idea Guernsey was occupied during the war. Apparently completely unprotected, they fell under German control in 1940. Now I’ve got my tea and eaten a slice of chocolate babka, I shall get back to reading. I’m a little early for the tenth hour report, but I’m afraid nappage must take place if I’m to make it to the night let alone through the night. I’m still reading my first book and I might be the slowest reader ever, but what can you do? It’s a little bit hard to believe as all the Society members appear to have found their perfect book and stuck with it through thick and thin, though it does make me want to read Seneca, though maybe not Carlyle. Admittedly they are all Great Books which have seen many people through hard times before, so I guess it’s possible. Just seems a bit convenient. It’s also a bit depressing with the war and all. The Nazis sucked just as much on Guernsey as they did everywhere else. Though there are uplifting scenes, too. Sleep Readathon Hour Oof – Slept so badly I couldn’t wake up at the appointed hour of 8 AM. Now I need to get ready to play tennis. So hours 1-4 are going to be pretty much a washout. Hopefully after that I will apply myself in a more becoming manner. Maybe guacamole and chips. And more coffee. It’s coming! That moment some of you have been waiting for. And I. I have been waiting for this moment since last October when I did my first marathon. Only this time Sunday is cleared, too, so sleeping may take place. Whether I can stay up until 8 AM Sunday, I doubt, but if I can, then sleeping can follow. I haven’t decided what to read yet, or what to eat, but I am thinking long and hard about these important matters. I still have all my holiday books which I didn’t read because I read Swann. Christie, Wentworth, Sayers, Wodehouse. Light and short. But then, maybe I should throw a short classic in there. Maybe a Sherlock Holmes or Poe or… the possibilities are scarily near infinite. Last year I read the Ocean at the End of the Lane which was very good. It would be nice to have something like that in the mix. In a way it doesn’t matter what I think now. I’m a creature of moods and will read whatever I feel like when the time comes, though I also know there are books in the world I would enjoy more than all the others, but how to find them is the question. A mystery with an 11 year old genius as the detective can be annoying. And it is, sometimes. Mostly it wasn’t Flavia’s unnatural intelligence and love of chemistry that put me off. 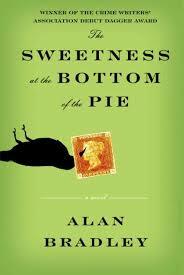 Child geniuses are dime-a-dozen in fiction. Lots of people seem to love her, but I could never decide if I liked her or not. The dynamics of the family definitely put me off. The absent though present father. The cycle of prank and revenge with the sisters I found especially tiresome. Am I supposed to be amused that Flavia poisons her sister’s lipstick? Cuz I’m not. And, of course, no adult knows about this, so all the punishment is meted out by her sister, whom Flavia will then get back at. Honestly, they could all use a stretch behind bars. I think the issue is I just didn’t find the story believable. A murder takes place below her window and sharp-eared Flavia hears nothing? Also, it seems to have taken 3-4 hours for the victim to die, though it shouldn’t have as far as I can tell. The idea that the criminal still had the stamp he stole as a school boy and hadn’t found a way to get rid of in the intervening decades is also strange. A stamp that’s almost unique, incredibly valuable, and his friend becomes a shady stamp dealer in America. In all that time, they never find a buyer? Writing this out helps me though to realize how irritated I was with the plot. In mysteries so often one keeps reading because you want to know who, how and why. There were also times I just didn’t get why Flavia did what she did in her investigation. At one point, late in the game, she goes to find an old gravestone. She already knew about the person’s death, what did she expect or hope to learn from the stone? It was his first one, so I might give the next one a try. It wasn’t as irritating as the woman who microwaved a frozen cake. And I do love the titles.